I like the photographic art of Edward Weston. As a student in the digital imaging program at Lansing Community College, I saw myself as a landscape photographer. This was only natural. I am educated, and have worked, as a forester and as an archaeologist. For decades, I have dedicated myself to learning about landscapes—about plants, rocks, and how features like mountains, valleys, and sand dunes come to be. I have written about landscapes too. Both of my master’s degrees, along with my Ph.D, revolved around the study of landscapes. Weston’s “Dune, Oceano, 1936” is amazing. As soon as I saw this image, I knew that someday I wanted to travel to those dunes and photograph them myself. The very next year an opportunity arose for that to happen. At the invitation of a friend and his wife, I flew to California and joined them for a journey down the California coast from Carmel to Los Angeles. I was hoping for Weston Weather—clear skies and a bright sun that would provide the high contrast conditions represented so well in dune photographs created by Edward, and later by his son Brett. However, we arrived in Carmel just as the first major winter storm of the season was approaching the Pacific coast in that area. Strong winds out at sea were causing the sea to lash the rocky shoreline with swells that at times were over five feet tall. Despite the dicey weather predictions, we made the decision to drive down the Pacific Coast Highway to Morro Bay. We knew that there was a big storm coming. And the highway is little more than a narrow, serpentine strip of pavement cut into the high cliffs above the sea. But we thought we might be able to reach our destination before the storm hit. Besides, we thought, how bad, really, can a rainstorm be? We all grew up in South Florida, and were well experienced driving in heavy rain. The drive started out just fine. But before long, we found ourselves in the middle of near gale-force winds and horizontal rain. Visibility was reduced to only about a hundred feet or so. Small and medium-sized rocks were occasionally rolling down the steep hillsides above us onto the highway, making driving somewhat dangerous. The experience of high winds, a narrow and twisting road, rock falls, and knowing that a mistake could potentially take us down into the ocean far below, was definitely one to remember. We were all very relieved when, after several hours of white-knuckle driving, we finally reached flatter and safer ground far to the south. The very next day we continued our travels south, arriving at the Guadalupe-Nippomo Dune Complex very shortly after sunrise. Skies were still very overcast. Huge black clouds scudded past, driven by remnant storm winds. Heavy rains of the previous day had patterned the sands with small pock marks and etched numerous small terraces in its surface. Although the light was diffused, there were still interesting contrasts between lighter and darker areas of sand. With Edward Weston’s art as my guide, I walked out into the most incredible dunes I had ever seen in my life, searching for striking scenes of form, line, light, and texture. Of the photographs I created that day, this one is my favorite. I love the fact that it is simultaneously a landscape and an abstract. I love the sweeping shape of the dune and the coarse texture of the sand. 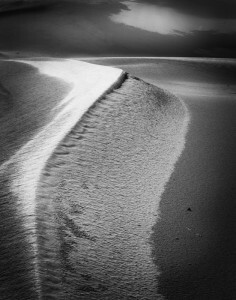 And I enjoy the loss of scale; it is very difficult to tell much about the length of the dune from this image. There is no sky or other referent. When I was graduating with my photography degree, the school purchased this artwork for its permanent collection and honored me as a recipient of the Zimmerman Visual Arts Award. Edward Weston, thank you.